Spinnaker’s flush diffuser assemblies are available in sizes ranging from 2 to 30 tons. Features include a fixed 4 way pattern supply diffuser, aluminum egg crate core return air grille, full cabinet with internal insulation, corner hanging brackets, top supply and return duct connection flanges, and internal return air transitions. The exposed portion of the diffuser is provided with a white enamel paint finish. These assemblies offer a flush appearance at the ceiling, and longer throw patterns ideally suited for higher ceiling heights. They provide a substantial cost savings over a conventional duct system. Optional construction of stainless steel and aluminum provide superior corrosion resistance in difficult environmental conditions. Custom color matching is offered. Spinnaker’s step down diffuser assemblies are available in sizes ranging from 2 to 30 tons. 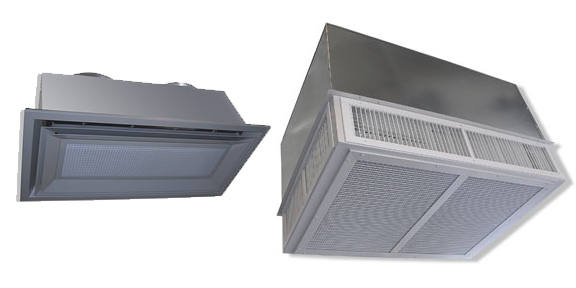 Features include double deflection adjustable supply grilles on all 4 sides, aluminum egg crate core return air grille, full cabinet with internal insulation, corner hanging brackets, top supply and return duct connection flanges, and internal return air transition. The exposed portion of the diffuser is provided with a white enamel paint finish . These assemblies offer adjustability of air pattern, quiet operation and substantial savings over the cost of a conventional duct system. Optional construction of stainless steel and aluminum provide superior corrosion resistance in difficult environmental conditions. Custom color matching is offered. Various supply only versions are also available.